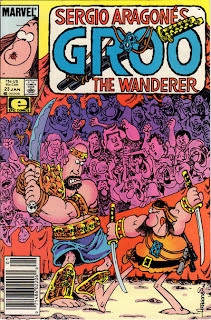 This issue seems to set up a class-based conflict, sending Groo into a land where the kings eat well and the people starve, but it ends up just having our "hero" get involved in food-based conflicts with said monarchs, rather than making any statements about society (outside of acknowledging that economic disparity exists). 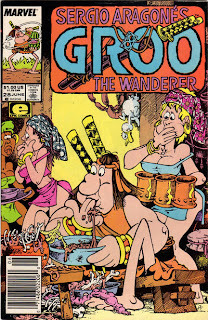 That sort of thing would have to wait, but what happens in this issue is arguably a lot more fun, with Groo just trying to get a good meal to eat, then setting out on a quest to find a cook for one of the kings. 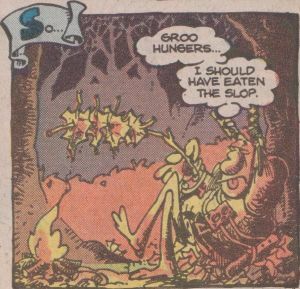 There are plenty of good gags, a lot of them pertaining to Groo's repeated failure to locate a suitable chef, as he leads the king's man to people living in caves who only eat bats or almost gets him served as a meal in a village of cannibals. 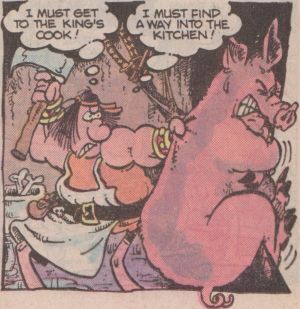 He eventually finds a great cook, but sparks a war between the kings in a dinner scene which, had it played out a page or two longer, could have led to an awesome food fight. 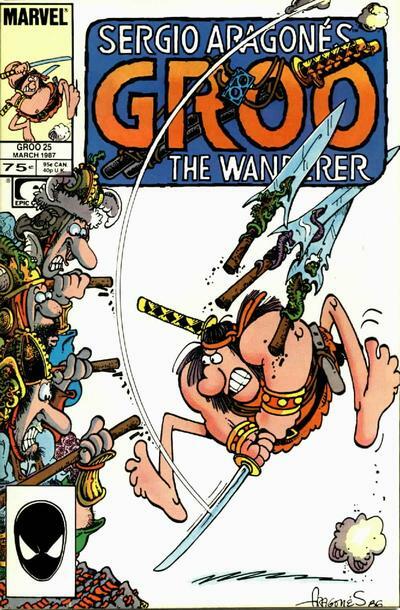 As fun and hilarious as Groo's adventures are, the depth of the world around him makes the series so much richer. He's not getting up to his antics in a vacuum; he's affecting the lives of many people who are just struggling to survive, and that ends up providing more to think about than the funny ways in which he kills people. Man, I do love this comic. Moral: "The way to a man's heart is through his stomach--a route which takes you nowhere near his brain." 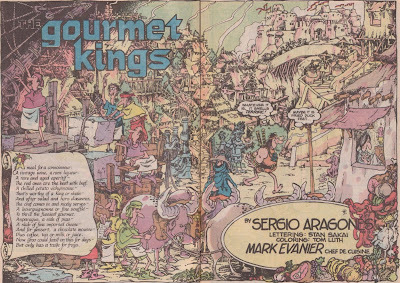 Spanish words: The kings and kingdoms are named after meals or food, including Almuerzo ("lunch" or "dinner"), Merienda ("picnic"), and Sopa ("soup"). 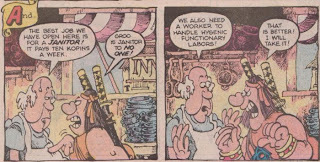 There's also a butcher named Cerdo ("pork"), and a fat woman is named Pompas ("bubbles"). Running jokes: Mentions of cheese dip and mulch (I thought they didn't do that joke anymore?). It takes a full ten pages for the "What do you mean, 'slow of mind'?" gag to pay off this time. I hope this gap eventually stretches out to multi-issue length. 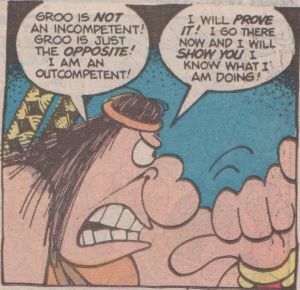 In something of a reversal, Groo, after briefly succeeding, asks "I did not err?" and gets the reply of "Not yet!" 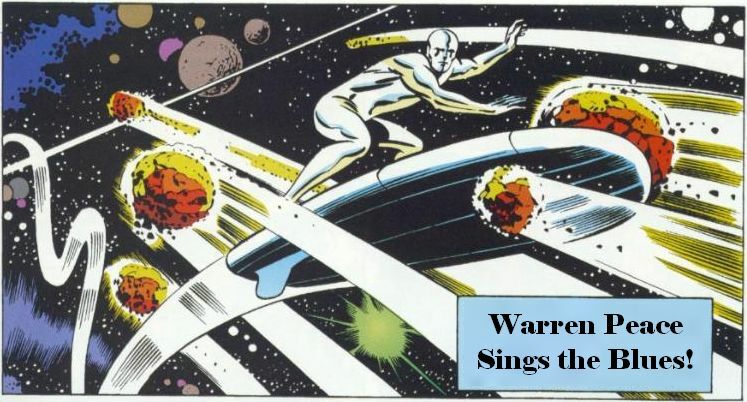 (don't worry, he does). He also responds to being called inept by saying that he is "non-inept", which, not being as funny as saying he is "ept," might mean that this joke is on its way out. Letter column jokes: Brent Anderson writes to say that he likes all the killing, maiming, and death in the Groo comics. 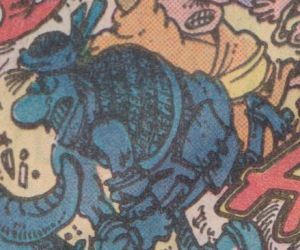 Mark recommends that he check out Strikeforce: Morituri, but doesn't think he'll like the artwork, which was done by "a drop-out from a remedial drafting class at the Escondido School for the Hopelessly Bewildered." 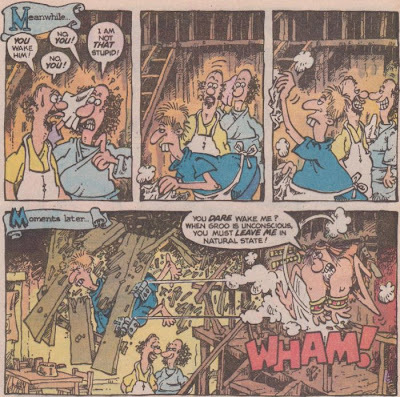 Another reader asks what Mark does, "besides transilluminating, dehaveraling, and reading comic books", and Mark says that he writes sneaky, underhanded plugs for comics drawn by Brent Anderson. A reader named Barry Bell complains that his letters never get printed, and after noting that he and Sergio read all the letters and really appreciate them, even if they can't print them all, says that their mail room has standing orders to throw away any letters from Barry Bell. 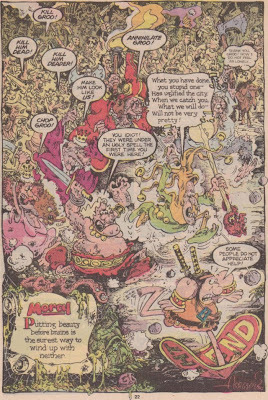 Answering the next letter, which asks how they pick which letters get printed, Mark says they go through them all, throw out any asking for sketches from Sergio, any wanting to know what "mulching" means, any asking about Sage's dog's name or the blue thing on Groo's chest, and any from Barry Bell. He says "This process leaves us with about nine letters. We then pull out all the ones that are intelligent, incisive, crisply-written, and filled with perceptive commentary. Once we get rid of them, we print what's left." 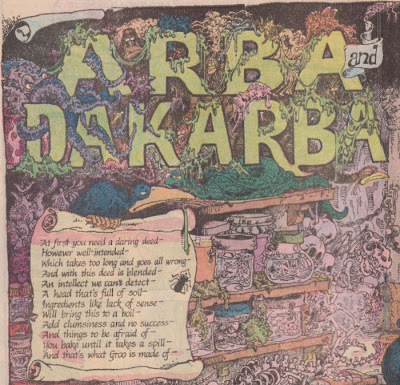 It's another issue with recurring characters, with the witchy pair Arba and Dakarba showing up to get Groo to do something for them. 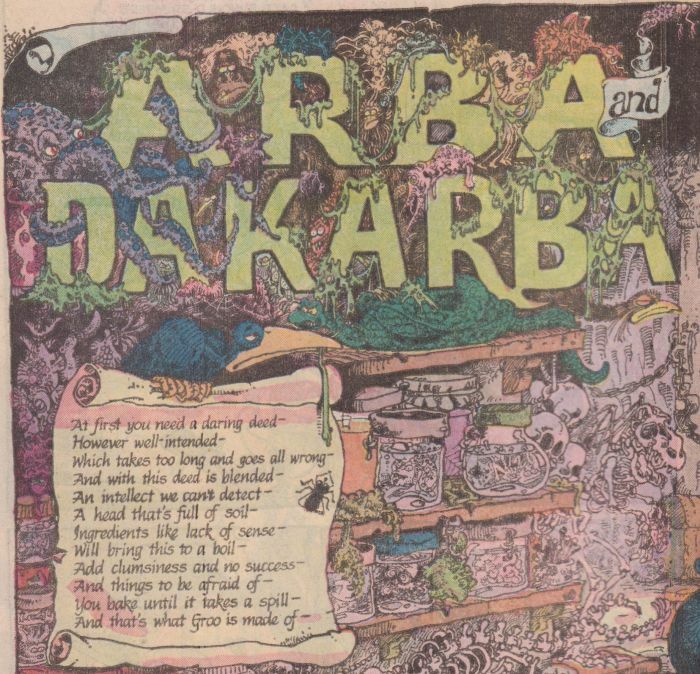 Their earlier appearances mostly seem to consist of one or both of them trying to get their magical powers back, and in this case, Dakarba sends Groo to get an amulet for her, even though she and Arba both seem to expect him to fail. The shrink him down to tiny size and send him to invade an underground city of tiny people (elves? 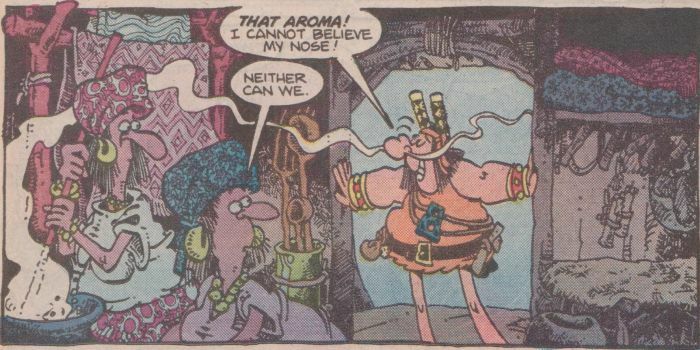 They have pointy ears and wear genie clothes, so who knows), which leads to all sorts of silliness when he ends up going on another quest to steal the other half of the amulet from somebody else, then eventually obtaining the combined amulets, which grant the owner great powers, but he's too stupid to realize it, causing him to ruin everything for everybody just get them all mad at him. 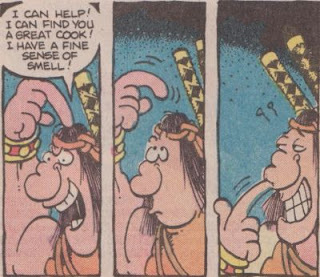 So, a pretty normal day in the life of Groo. 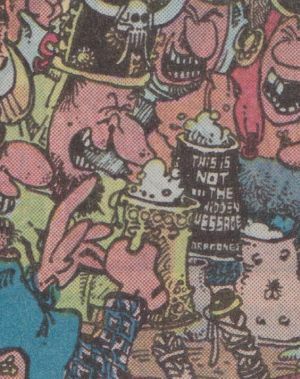 I love that kind of thing, and I love that this world that Sergio and company have created gives him a chance to throw whatever he wants onto the page, no matter how weird or silly. 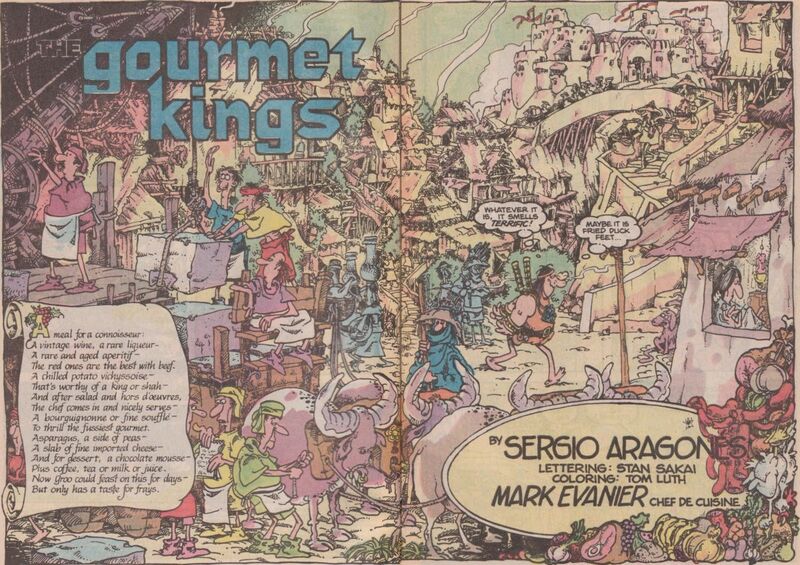 Next: I don't have issue #27, so next will be #28, "The Gourmet Kings"
Recurring characters: Arba and Dakarba. 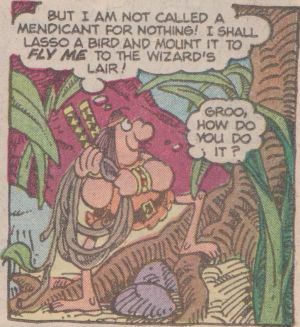 I'm not sure if the Great Wizard has shown up before, but Groo seems to know him, so he was probably in one of the issues I don't have. Moral: "When the employee is a fool, so is the employer." Spanish words: Enano, the name of the tiny king, means "dwarf." Letter column jokes: This issue's letter column is just one joke, with a letter from editor Jo Duffy saying that the column will have to be shortened to make room for the Statement of Ownership, and a response from Mark in which he refuses to abridge his work, and threatens to bankrupt Marvel like they did Pacific. Incidentally, the average number of copies sold for the previous 12 months was 109,375, with the most recent issue selling 116,810 copies. 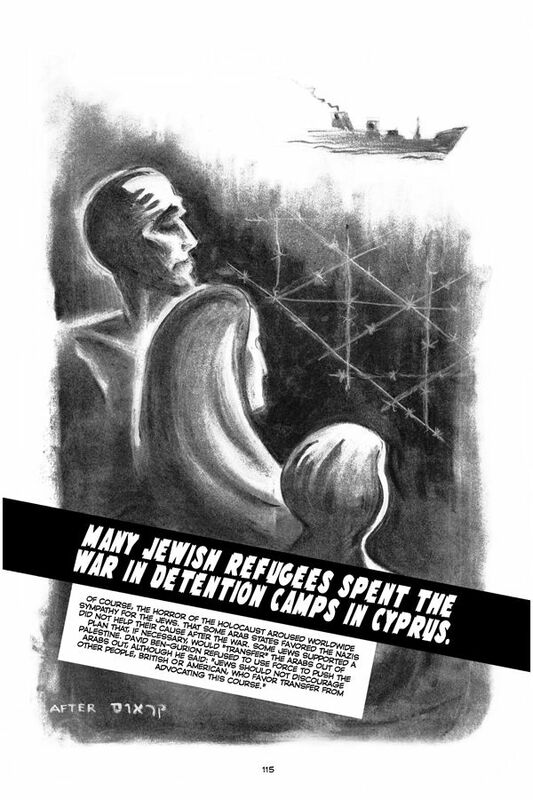 The ever-raging turmoils (political and otherwise) surrounding the nation of Israel and the Jewish people are nearly too much to wrap one's brain around, with the weight of thousands of years of history and countless atrocities, prejudices, genocides, and plain old wars surrounding them. And that's true even for somebody who has been thinking about these issues for decades, as Harvey Pekar obviously had; it seemed like he needed to get his thoughts on the subject down while he still had time, and that's what this book is: a discussion of what had been troubling him for years about his people and the travails of the "homeland" that his staunchly Zionist parents had been so supportive of. But he also wants to be sure that readers take him seriously as something of an authority on the subject, rather than just some guy with an opinion, so he spends much of the book detailing the history of the Jews, both before and after they managed to form the nation that has been the center of so much contention. Pekar frames the story as a conversation between himself and his artistic collaborator, J.T. Waldman, as the two of them drive around Cleveland, stopping at the book warehouse mentioned in Harvey Pekar's Cleveland, as well as the Cleveland Public Library, and seeing other sights around the city. One suspects that Waldman, who is credited with an "and" rather than as mere "illustrator" of Pekar's words, was something of a co-author, reproducing his interactions with Pekar and filling out what was probably an unfinished script upon Pekar's death. The talk ends up being a torrent of information, with Harvey starting his brief history of the Jews with Abraham, and following them up through the present day, pausing occasionally to go over his own history, including his parents' wholehearted support for Israel, his Jewish-school education, his misguided attempt to immigrate to Israel in the 60s, and his eventual disillusionment with Israel and its relationships with its neighbors, the Palestinians living within its borders, and the rest of the world. As interesting as Pekar's disquisition is, Waldman is the real star here, grounding the framing conversation scenes with a realistic style, then shifting into styles reflective of the eras being discussed, starting with Chaldean carvings and Mediterranean mosaics, and progressing to ornate Arabic/Persian designs, Medieval murals, and Renaissance artwork, then, when the narrative jumps to the twentieth century, mimicking styles like art deco and World War II propaganda posters. 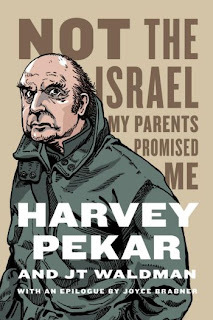 He's a restless artist, never sitting still, always jumping to a new artistic idea, especially in later scenes depicting Harvey's shifting ideas about Israel as files that fill the cart he pushes around at his V.A. job, or complicated emotions swirling around him like his beloved jazz music. And he doesn't stop there either, turning the scenes in which he and Harvey are driving around the city into meandering paths of panels winding across the pages and including lovely reproductions of some of its landmarks. It's incredible work, visually arresting and constantly moving, taking what is already an interesting subject told by a rightly revered storyteller and bringing it to the next level. 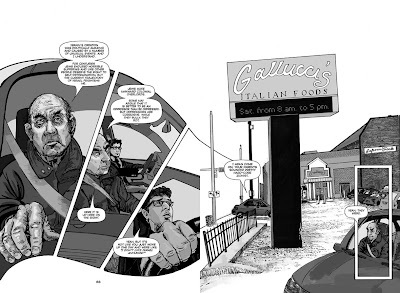 There's a reason Harvey Pekar is missed so much by those who loved his work, and that's because he put so much of himself into his comics, pouring his life and passions onto the page. He was always fascinated by people's stories, and that gets writ large here in a history of an entire race, which collides with his autobiographical impulses to form a grand story as tangled and convoluted as its inspiration. One might be somewhat disappointed to learn that in the end, for all his personal experience and studies, Harvey doesn't really have any answers or special insights into the situations faced by his people, but it's kind of comforting that he's in the same place as the rest of us. Maybe he would have been able to work out some sort of defining statement had he lived long enough to see the book's completion, but as it is, it ends on a perfect note of frustration, an aggravating inability to find a solution to the problems created by the human condition. That's the world we have to live in, even if we have to press on without Harv to guide us. 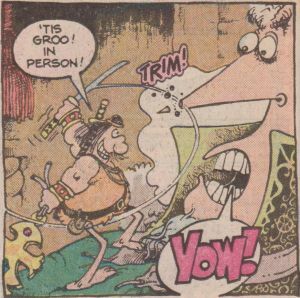 This is another wacky farce issue that involves Groo running back and forth a lot, and it's as funny as one would hope. 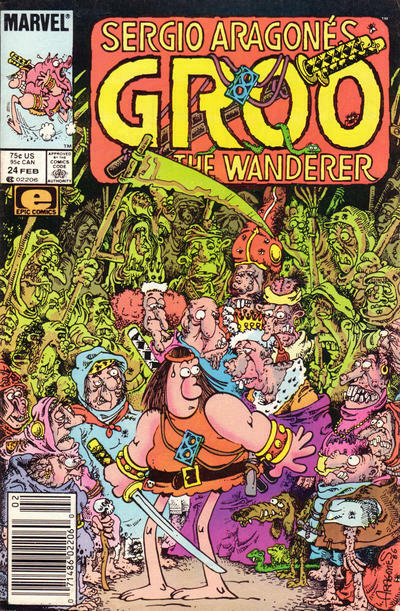 The pacing is a little weird, with Groo first wandering into a town and the people greeting him with horror, since they've survived all sorts of disasters, but worry that he'll be the last straw. But when he can't find work as a guard, since the village is already well-defended, he leaves without causing any problems. 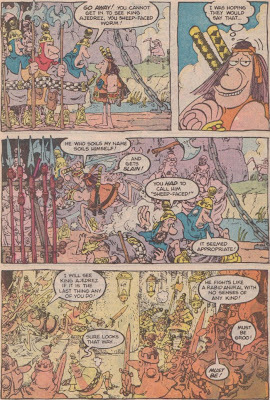 Then the real meat of the story begins, as he finds some people fleeing a town that is being sacked by bandits, takes up their cause and drives the bandits away, then runs into Taranto and his band of bandits, who decide to go attack the town themselves. 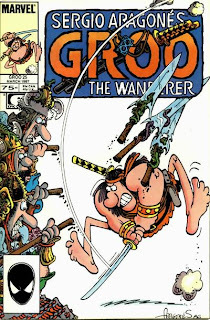 This sets off an escalating series of attacks and defenses, with Groo eventually taking a page from The Seven Samurai (as he already did once in issue #4) and deciding to train the people to defend themselves, but not before the town gets completely destroyed, leading everyone to just go and attack the original town from the beginning of the story, which we had mostly forgotten about. Looks like they didn't survive Groo after all! 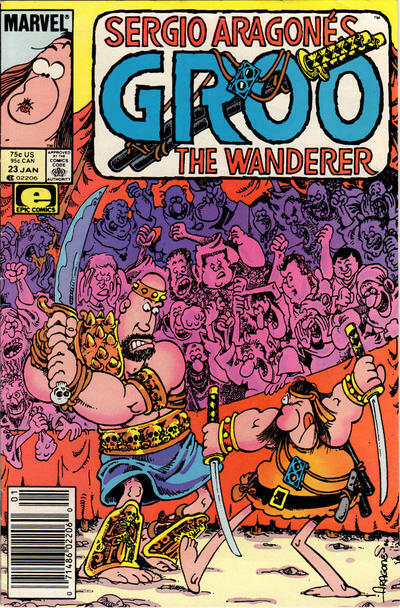 Good stuff, for the most part, although the issue isn't as well-structured as the best Groo stories, which click through their plots smoothly and lead to an inevitable goal. It's still pretty funny though, so I'll accept it. Moral: "To flaunt your strength is to make it your weakness." Spanish words: Carpeta, the name of the well-guarded town, means "folder". Alfombra, the not-so-well-guarded town, means "carpet". 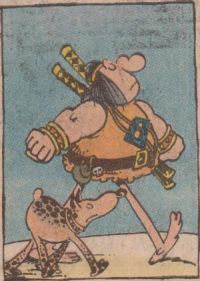 Turulato, the leader of one of the groups of bandits, means "nincompoop". Running jokes: This issue, the "Say, what did he mean, 'slow of mind'?" 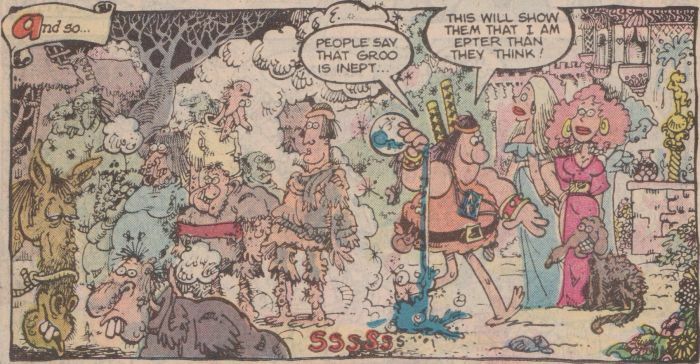 gag takes place a full page after somebody says it to Groo. 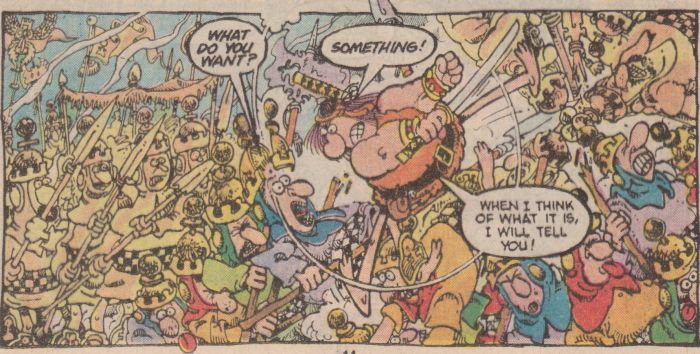 Groo can plainly see the answer to defeating the bandits. 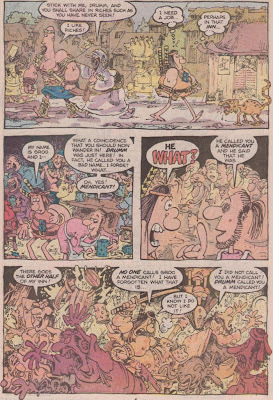 Letter column jokes: This issue's column consists entirely of answers to a list of numbered questions from letter writer Andrew Stern, with answers including a reference to the poor ratings of "TV's Bloopers and Practical Jokes" (which Sergio did animation for), references to Sergio's poor English (and the revelation that Mark has known him since 1969), a joke about Sergio missing the Creation Comic Convention in Anaheim because he had to go back to his job at Disneyland wearing a Dopey costume, an odd dig at Marv Wolfman, an appearance by editor Jo Duffy to reveal that there was a Groo story in Epic Illustrated #27, and a revival of the joke that nobody knows what Mark's job is. 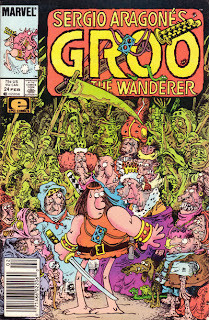 Groo gets more recurring characters to bounce off of in this issue, when the Minstrel seeks him out for help with Arcadio's current quest, in which he has to find a spell to free the people of his village (where we saw him last, in issue #11) from a curse. 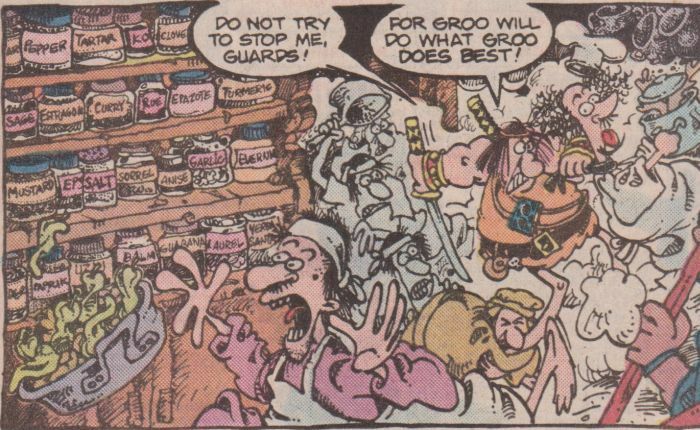 This might just be a contrivance of writing to get Groo involved in the story, but I think it adds an interesting wrinkle to the Minstrel's character. 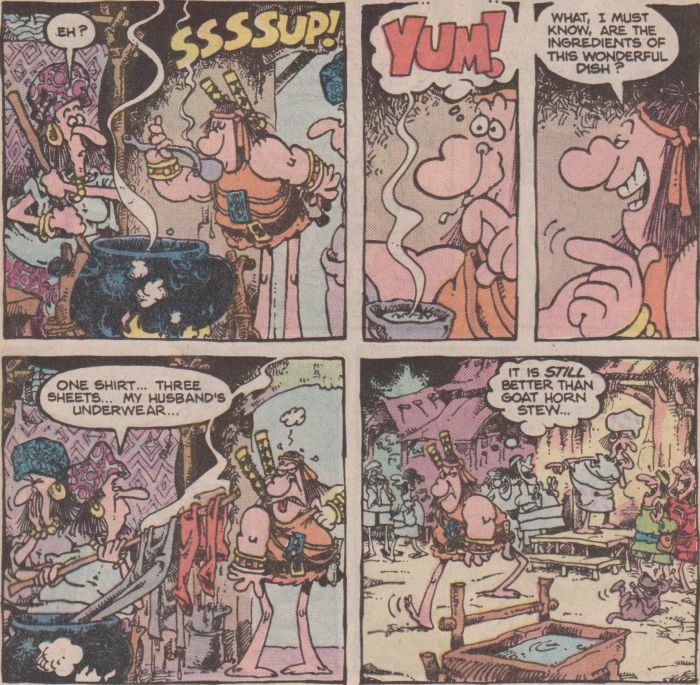 He spends all his time when he's with Arcadio praising the handsome warrior's abilities, but he seems to recognize that while Arcadio looks impressive, he doesn't have much in the way of skill, so he runs to get Groo's help at the earliest opportunity, since Groo was the one who did all the work in their previous quests. He might sing Arcadio's praises in order to share in his rewards, but he knows what's actually going on, making him more aware of the mechanics of this world than most of the characters. It makes sense, since he's not only a storyteller, but an entertainer, an implicit collaborator in the enjoyment of the audience. 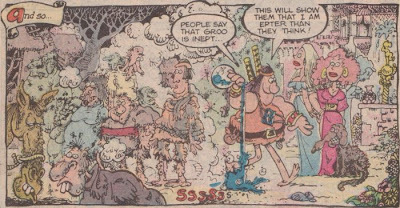 And of course, Groo manages to screw things up repeatedly, first obtaining a potion to cure the people, but since the last time he saw them, they were horrifically ugly, he thinks the curse they're under is that they're beautiful (instead of mind-controlled into a daze by never-stated means), so he turns them ugly again (I guess the potion just obeys the wishes of its dispenser) and runs off to procure payment for the potion. When Arcadio finds them, he only has obtained one magical cure, so he uses it to turn the people beautiful again and sets off to obtain another cure, setting off a back-and-forth series of transformations as Groo and Arcadio repeatedly discover that their transformations have been undone and set off to make them the way they should be. That's funny stuff. This issue does get a little repetitive, but it's always funny, with Mark providing laughs through dialogue and Sergio filling pages with his usual details to create a satisfying whole. I'll take it. Recurring characters: Minstrel, Arcadio, the Witch of Kaan. 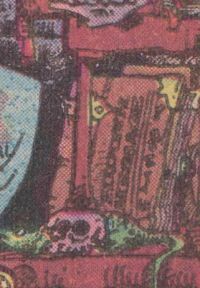 UPDATE: As revealed in issue #32, taking the first letter on each page (including both pages of the title spread), reveals the message "Jack must get his work back", a call for Marvel Comics to return Jack Kirby's original art pages to him (if you're not familiar with this bit of comics history, here's a transcription of a 1986 radio interview with Kirby, Mark Evanier, Frank Miller, and Steve Gerber discussed the issue). Moral: "Putting beauty before brains is the surest way to wind up with neither." 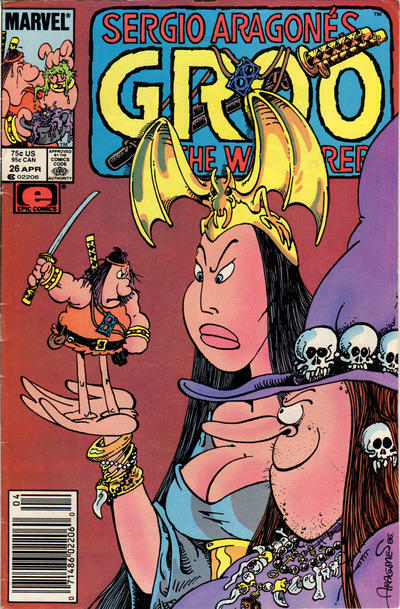 Spanish words: King Ajedrez, who Groo takes chess pieces from, has a name which means "chess". 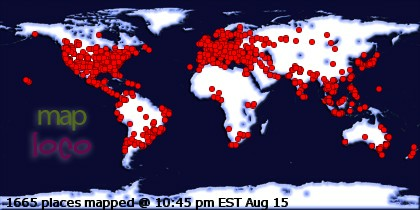 The Waters of Poderes ("powers") make another appearance. Letter column jokes: Mark continues to insist that he won't define mulch anymore, even if people ask him using silly letters composed of backwards words. 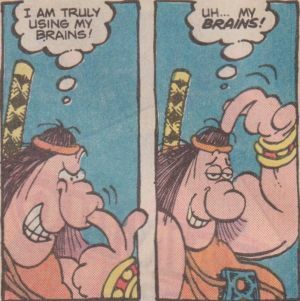 He also claims that we'll learn Sage's dog's name in his next appearance, says the stuff in Sage's vial is Perrier with a twist of lime, and says the skull on Groo's belt is Groo when he was a baby (?). The best joke this time is when somebody asks "When's the movie? ", presumably wanting to hear news about a Groo adaptation, and Mark gives showtimes for "Black Kung Fu Mamas" and "Nurses Go Berserk" at the Criterion. 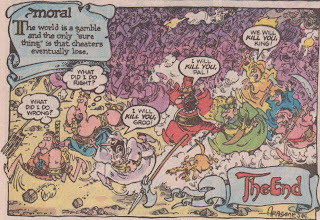 Finally, a reader asks about seeing Mark's name in the credits of the "Dungeons and Dragons" cartoon, and Mark admits that he works on that show (or worked, since it had recently been cancelled), along with "The Wuzzles", and he also developed a show "about tiny people" that was so bad, he took his name off it. 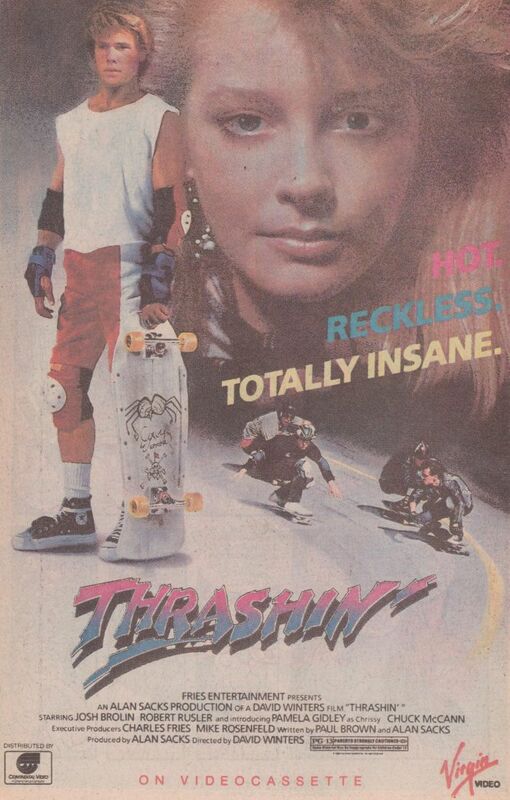 Does anybody know what show that one was? Last Friday night (August 17, 2012), cartoonist Anders Nilsen, creator of the astonishing brick of a book Big Questions, appeared at the Elmhurst Art Museum in Elmhurst, Illinois to do a reading/slideshow and talk about the exhibit of his works that has been on display at the museum since June 2012 (and which ends on August 25, if you’re in the area and haven’t had the chance to check it out). It was definitely worth attending, since any chance to see an artist talk about his work is bound to be fascinating, and seeing the art in person is always a treat, especially when it’s presented at a scale which is impossible to replicate in reproductions. The centerpiece of the exhibit was the drawing which shared its name, Adam and Eve Sneaking Back into the Garden to Steal More Apples, a 5’ x 8’ monstrosity that Nilsen said he struggled with for quite some time, often feeling that it defeated him. It’s a marvel of detail, from the dense tangle of thorns which the couple (who are presented as adolescents) are climbing over, to the various animals and creatures populating the garden, to the anachronistic implements of modern life (a computer keyboard, a tire, etc.) scattered on the ground, to the tiny blades of grass that provide the signature Nilsen texture to the image. Nilsen described the image, and some of the others that he worked on, as ones that he doesn’t fully understand, presenting several possibilities, including a post-apocalyptic world, which, along with mythological/religious stories, was a theme that several of the exhibit’s works shared. It’s an impressive work, one that can be studied and pondered endlessly. That’s true of several other works as well, including the above study for Adam and Eve, called Jesus and Satan Playing in the Garden of Eden, which depicts the pair as children romping through the same thorny landscape, which includes a huge chunk of concrete that, again, suggests some apocalyptic ruin. Nilsen spoke of trying to reinterpret or adapt mythological or religious stories, filtering them through some of his own interests and incorporating modern details, while still retaining some ambiguity. Another large piece, which Nilsen drew while taking a break from Adam and Eve, is Last Remnant After the End of the World, although he says that the title is kind of incidental, and it was more of a study of the root ball of a tree that he found interesting. It was also an expansion of another drawing that was more of a simple rock, adding details and making it much more dramatic. It’s another marvel of detail, packed with texture and palpable dirt and decay, yet including a hint of life after death with the branch sprouting from the top of the stump. For the slideshow presentation, Nilsen read from an “accordion book” which he had on display called Rage of Posiedon, which takes the form of a series of silhouette images accompanied by text, making for a series of short stories that continues the theme of reimagined or recontextualized mythology. 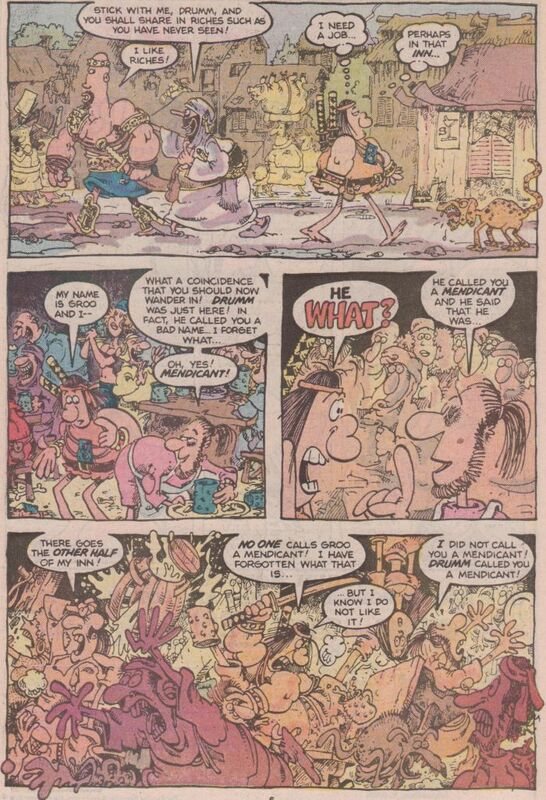 The title story follows the god of the sea as he struggles to understand the modern world, while other stories included a take on the Biblical story of Abraham’s sacrifice of Isaac from the boy’s perspective, a poignant look at the fall of Lucifer, and an amusing scene in which Jesus hits on Venus in a bar in Heaven. The simple art style is a bit of a change for Nilsen, who usually packs imagery with palpable details, but it frees him to focus on the text of the stories, which incorporate the dry humor of his sketchbook work in books like Monologues for Calculating the Density of Black Holes. The book itself was also on display, making for an interesting artifact, a 28-foot series of images that could be compressed to fit into a cover. Drawn and Quarterly will be publishing a version of it that will include a few more stories in the fall of 2013. 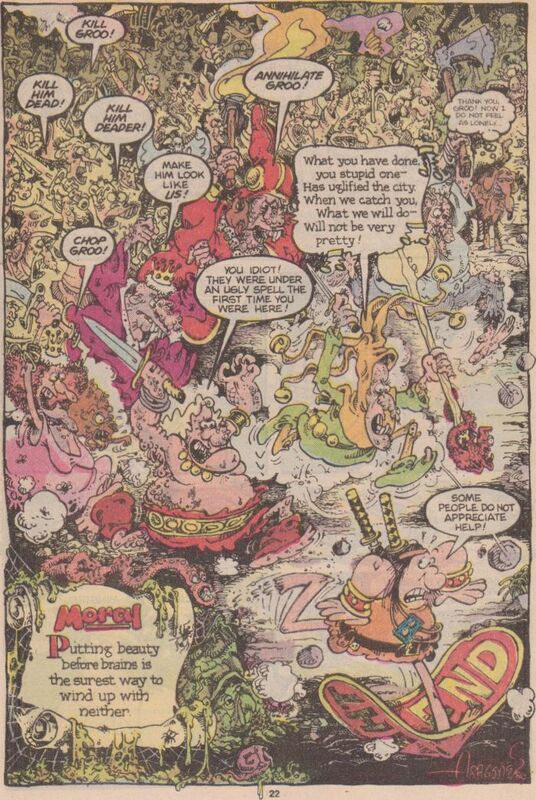 Other works on display included a few pages from Big Questions, and a scene of Batman, Wolverine, and the angel Gabriel all lying unconscious around a hole in the ground, suggesting some sort of unknown catastrophe and inspiring any number of stories in viewers’ minds. 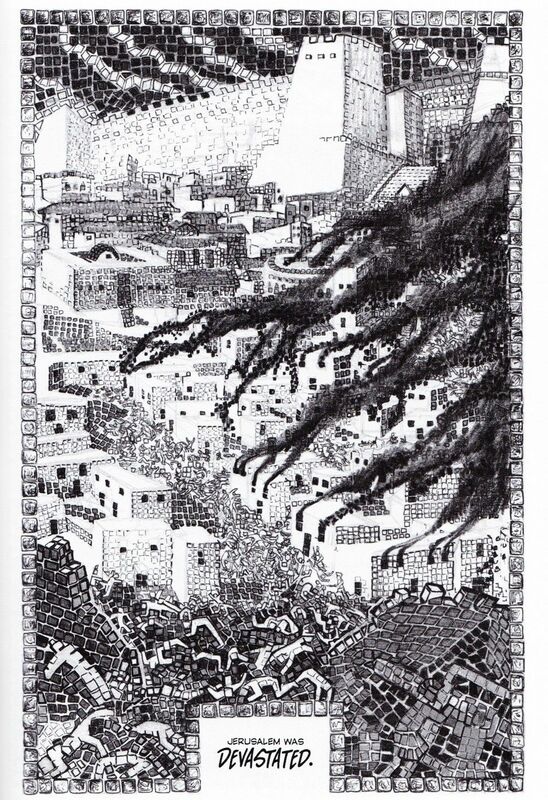 Another drawing shows what the title says is a prototype for human life, presumably created by God, and it’s another lovely accumulation of weird detail, inspiring a story through its title and suggesting all manner of narrative around it. As a collection of an artist’s work, the exhibit is fascinating and inspiring, a testament to the artistic skill and ambition that Nilsen has coming out of his pores. Whether he continues along this path, creating gallery-presented images, or makes more comics and narrative works, it will be a treat to follow him and experience what he has to show us. Nope, never a dull moment. Recurring characters: This is the first appearance of Pal and Drumm, who would show up many more times. 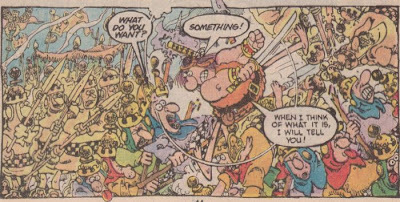 Also, at least three of the Groo Crew (Sergio, Mark, and Stan; I don't see Tom, unless he's way over on the left) are cheering on the Drumm/Groo fight on the cover. 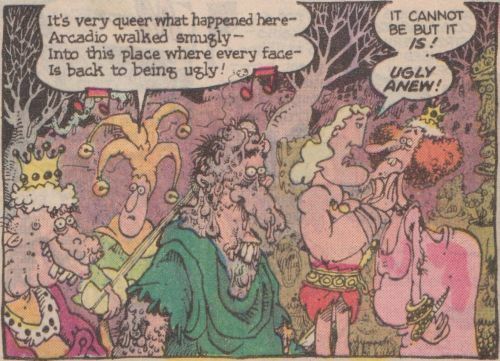 Also, Pal mentions being banished by the queen of Onovid, which, spelled backwards, is a reference to Mark Evanier's friend and co-writer- Sharman DiVono. 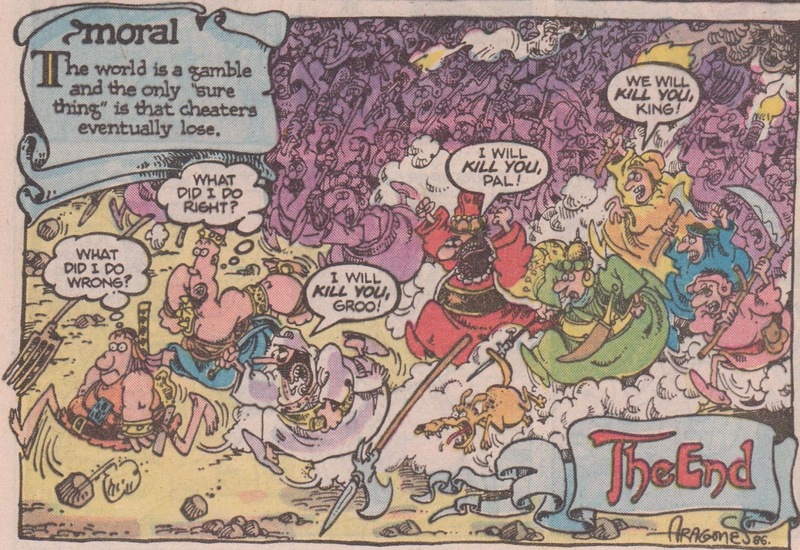 Moral: "The world is a gamble and the only 'sure thing' is that cheaters eventually lose." 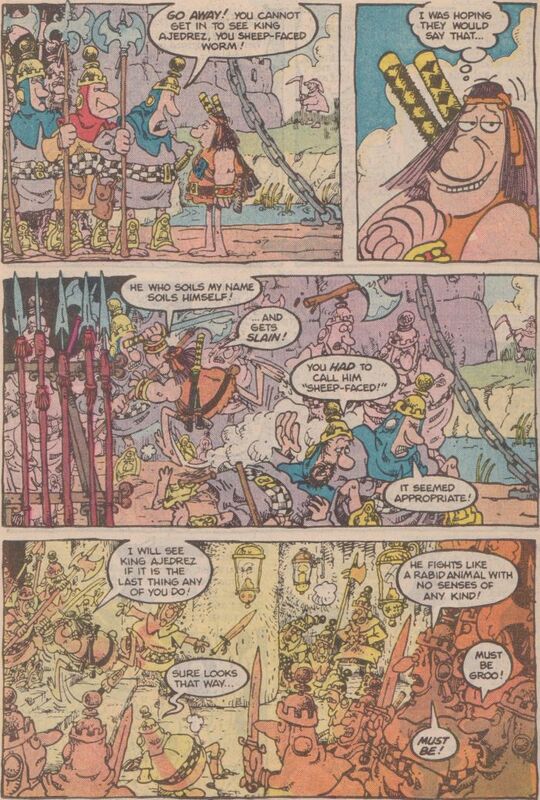 CONAN: By Crom! You are a mendicant! 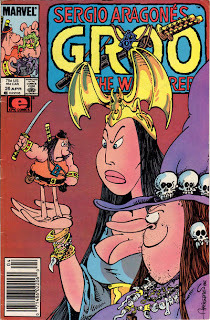 GROO: Oh, I am, am I? Well now, Groo does what Groo does best! SOUND EFFECTS: Hack! Slash! Slice! Spurt! Poke! Et cetera! Harvey Pekar's Cleveland: Isn't it everybody's?